Those who lost their lives in the Azerbaijani town of Khojaly in 1992 have been commemorated with an emotionally-charged concert in the Salle Mozart in Strasbourg. 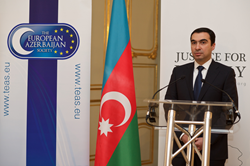 The event was organised by the Azerbaijani Representation to the Council of Europe and The European Azerbaijan Society under the auspices of the Justice for Khojaly campaign. This was a cruel mass slaughter, and took the lives of innocent, defenceless, civilians. On 18 February 2015, a moving classical concert took place amidst the stunning surroundings of Strasbourg, in the beautiful Salle Mozart, in commemoration of the victims of the Khojaly Massacre in 1992 – the worst single atrocity of the Armenian–Azerbaijani conflict over Nagorno-Karabakh. This claimed the lives of 613 civilian victims in 1992, including 70 elderly people, 106 women and 63 children. More than 150 guests, including diplomats and representatives from international institutions, the private sector, civil society and media, attended the event. Marie-Laetitia Gourdin, Head, French office of The European Azerbaijan Society (TEAS), explained: “TEAS and the Azerbaijani Representation to the Council of Europe are proud to organise this event in memory of the Khojaly victims, within the framework of the Justice for Khojaly campaign. The rapid development of this campaign is a measure of international support for the restoration of justice in the region. This backing has been expressed at events in over 100 countries in Europe, America, Asia and Africa, and has come from individuals and international organisations, as well as states. TEAS is organising events within the Justice for Khojaly campaign in London, Paris, Brussels, Berlin, Bern, Dublin, Istanbul, Ankara, Rome, Luxembourg and Vilnius, in addition to tonight’s jointly-organised event in Strasbourg. “It is appropriate that tonight’s commemoration takes the form of a classical concert as a tribute to Azerbaijan’s intangible cultural heritage, as Khojaly is located in the Armenian-occupied Nagorno-Karabakh region of Azerbaijan, which is a cultural hub and synonymous with the development of the country’s music. The town of Shusha, currently in ruins, was known as the Conservatoire of the Caucasus. It was the birthplace for many of Azerbaijan’s leading musicians, singers and composers, including Uzeyir Hajibeyli, the father of Azerbaijani classical music; Sadigjan, who developed the Azerbaijani tar; many of the finest mugham singers; and the legendary opera singer Bul-Bul, who trained at La Scala, Milan. Reflecting the ambiance of the Salle Mozart, constructed during the Age of the Enlightenment in the 18th century, the concert programme blended Azerbaijani and European classical and modern pieces, performed by two talented and internationally renowned Azerbaijani pianists who are long-term Paris residents – Renara Akhoundova and Saida Zulfugarova. Renara focused on her own compositions, many of which take their point of departure from Azerbaijani folksong and mugham and are imbued with a spiritual dimension. One piece was entirely improvised, creatively channelling the thoughts and emotions of the audience as they reflected on the Khojaly Massacre. Saida Zulfugarova then joined Sarah Nemtanu (violin) and Alexander Somov (cello) to perform two classics from the Azerbaijani repertoire by Kara Karayev and her relative Ogtay Zulfugarov, in addition to works by Antonín Dvořák and Franz Schubert. Despite the passing of four UN Security Council resolutions against the invasion, Armenia continues to occupy Nagorno-Karabakh and seven surrounding districts to this day. Currently nearly 20 per cent of Azerbaijani territory remains occupied, and approximately 875,000 refugees and internally displaced persons (IDPs) remain spread across Azerbaijan. The evening was dedicated to the memory of the Khojaly victims and those Azerbaijanis who have one wish – to return home in peace.